Blumhouse's Truth or Dare (film, 2018). A 2018 American supernatural horror film with "PG-13" rating by Universal Pictures. Directed by Jeff Wadlow. Official Trailer. Blumhouse's Truth or Dare is a 2018 American supernatural horror film directed by Jeff Wadlow. 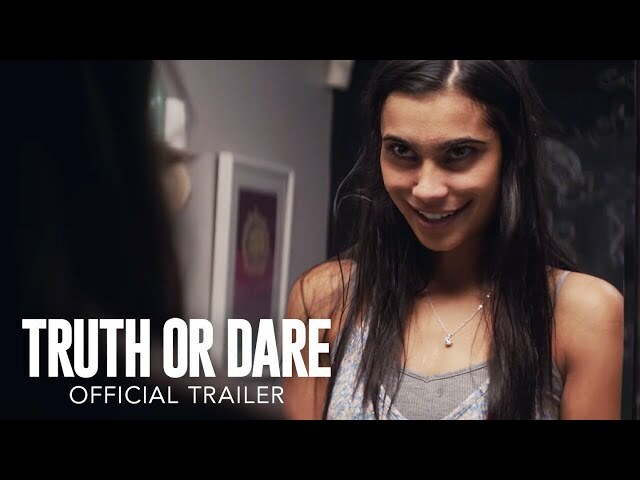 Blumhouse's Truth or Dare - Official Trailer . Olivia Barron, her best friend Markie Cameron, Markie's boyfriend Lucas Moreno, along with Penelope Amari and her boyfriend Tyson Curran, and Brad Chang go on a trip to Rosarito, Mexico. In Mexico, Olivia runs into fellow student Ronnie who proceeds to harass her until a man intervenes on her behalf. The man introduces himself as Carter and eventually convinces her and her friends to join him for drinks at the ruins of a mansion. There, Carter initiates a game of Truth or Dare with Olivia and her friends, plus Ronnie, who followed the group. Eventually, the game ends when Carter reveals that he deceived Olivia as a means of tricking her and her friends to the mansion to offer them in his place in the supernatural game of Truth or Dare. As Carter leaves, he explains to Olivia that the game will follow them and they must not refuse it. When leaving class Olivia notices "Truth or Dare" carved into the side of her car. She instantly blames Ronnie who just happens to be in the area. Stating that the flyer in the mailbox and the writing on her desk is one thing but the car will cost her a lot of money, to which he replies that there is nothing on her car and that she is crazy, but he likes crazy. Olivia goes looking for Markie and is told that she is in the library. When she arrives a girl with red hair walking by speaks to Olivia when Olivia turns to respond the girls face morphs and she asks Olivia Truth or Dare. When Olivia asks her to repeat what she said she is surrounded by people in the library chanting Truth or Dare. When she chooses truth, she is told to tell her best friend Markie's deepest secret to which she blurts out, "Markie constantly cheats on Lucas". The library goes silent as Lucas stands from the table and asks if it's true. Principal photography began on June 7, 2017, and wrapped on July 12, 2017, in Los Angeles. The film Blumhouse's Truth or Dare was scheduled to be released by Universal Pictures on April 13, 2018 (United Kingdom, United States), on April 26, 2018 (Russia), on May 2, 2018 (France), on May 3, 2018 (Denmark) and on May 10, 2018 (Germany). The duration of the film is 100 minutes. With a budget of $3.5 million, the film grossed over $95.2 million. Blumhouse's Truth or Dare got low rating from critics. The audience dislikes the film either. Audiences polled by CinemaScore gave the film an average grade of "B-" on a scale ranging from A+ to F.